For the 24 hours to 23:00 GMT, the GBP declined 0.34% against the USD and closed at 1.2850, after UK’s consumer price inflation (CPI) slowed to a two-year low level of 1.8% on a yearly basis in January, weighed down by falling energy prices and compared to a climb of 2.1% in the prior month. Market had anticipated the CPI to record a reading of 1.9%. Other data showed that the nation’s retail price index rose 2.5% on an annual basis in January, compared to a gain of 2.7% in the preceding month. Additionally, the house price index climbed 2.5% on an annual basis in January, meeting market expectations. The index had recorded a revised rise of 2.7% in the previous month. Also, the non-seasonally adjusted output producer price index (PPI) advanced 2.1% on an annual basis in January, compared to a revised rise of 2.4% in the preceding month. Markets had expected the PPI to climb to 2.2%. In the Asian session, at GMT0400, the pair is trading at 1.2866, with the GBP trading 0.12% higher against the USD from yesterday’s close. Overnight data revealed that UK’s RICS house price balance declined to -22.0% in January, higher than market consensus for a drop to -20.0%. In the previous month, house price balance had registered a reading of -19.0%. 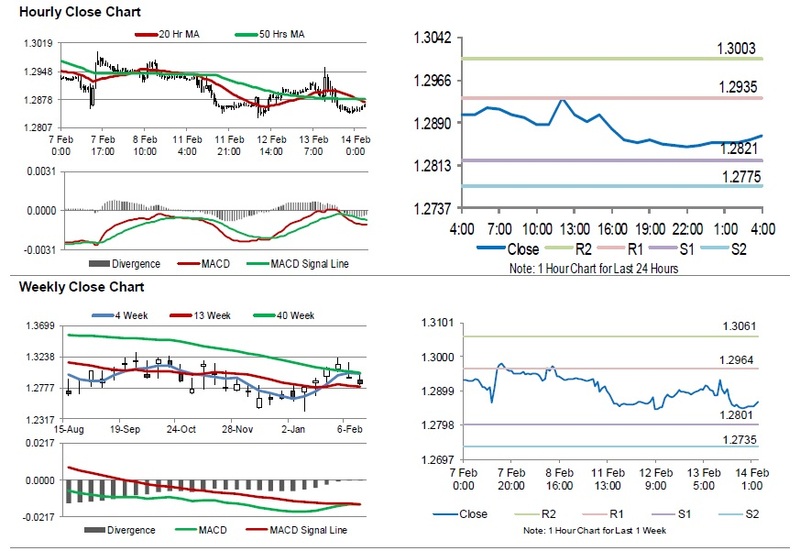 The pair is expected to find support at 1.2821, and a fall through could take it to the next support level of 1.2775. 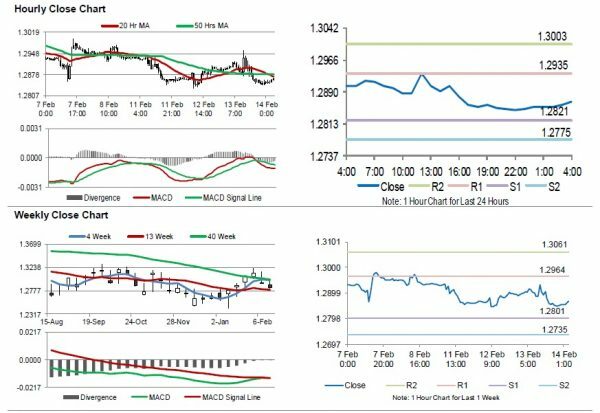 The pair is expected to find its first resistance at 1.2935, and a rise through could take it to the next resistance level of 1.3003. Amid lack of macroeconomic releases in UK, traders would focus on global macroeconomic releases for further directions.